Is a 1989 Suburban, it is licensed as a non-transport of patient’s vehicle that is equipped to a basic medical response level. In 2012 an upgrade was given to the body work and it was equipped with a new roll-out storage compartment; to ease access to the emergency equipment inside. This apparatus is a 1986 one ton pickup supplied to Hope Fire by the Department of Natural Resources. Its primary function is for off-road fire suppression, it is equipped it a 200 gallon water tank; and can pump 80 gallons per minute. Where water is important, this truck, called a pumper, can provide it. It is a 2006 International, equipped with a 1000 GMP and more importantly a C.A.F.S. unit. C.A.F.S. ; Compressed Air Foam System, is a fairly new technology in that foam and air are mixed with water for fire suppression, important especially during the initial attack. Having an adequate water supply is always an issue in rural fire fighting, being able to mix water with foam, reduces the amount of water usage on a fire. 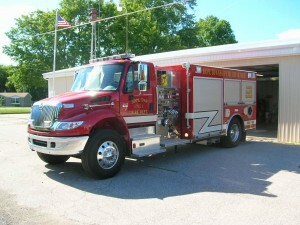 Currently being constructed to our specifications, this apparatus is due for delivery to Hope Fire in the spring of 2013. 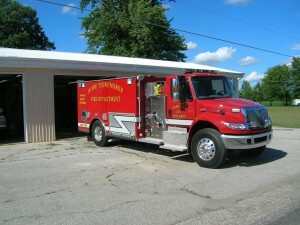 It is a 2012 International; it is equipped with a 400GMP and can carry approximately 1900 gallons of water. It will be a welcomed addition to our fleet of firefighting apparatus. Look for pictures coming soon to our photo page.